What do the companies Arvi, MG Baltic, part of the so-called officials and Russia's aims to penetrate Lithuania's energy system have in common? The conclusions of the Seimas National Security and Defence Committee (NSGK) investigation show that the common link is Rosatom interests and in many cases – former MP Mindaugas Bastys. The document reminds that the NSGK has already concluded that M. Bastys acted against state interests through maintaining close and constant relations with representatives of the Russian Federation state nuclear energy corporation Rosatom, which began construction of the Baltic nuclear power plant in Kaliningrad Oblast and Astravyets nuclear power plant in Belarus. And the close relations of now former MP M. Bastys with former and current Russian Federation intelligence and security structure officers, Kremlin affiliated journalists and former, as well as current figures in the criminal world are a threat to national security. The NSGK concluded already earlier that M. Bastys, by mediating for Rosatom and companies linked to it, for intelligence and security structure officers, Kremlin affiliated journalists and former, as well as current figures in the criminal world, sought to influence political processes and top state officials in Lithuania, who could adjust Lithuania's geopolitical direction and cause harm to the Lithuanian state. Delfi reminds that despite such conclusions by the NSGK, which were supported by MPs, the Seimas, disregarding a Constitutional Court ruling that M. Bastys broke his oath and severely breached the Constitution, did not strip his mandate. After such a slight, the Seimas opposition sought to initiate snap Seimas elections, while the "Farmers" sought to impeach the Conservatives. With all the uproar rising, M. Bastys resigned from the Seimas himself. During a previous parliamentary investigation, information was obtained on the links between Lithuanian politicians and business representatives' links to individuals, who could threaten state interests and potentially have illegal influence in decision-making. The conclusion specifies that in autumn 2012, the Arvi group's head, Russian Federation honorary consul Vidmantas Kučinskas, backed M. Bastys and sought that after the Seimas elections when a new cabinet is formed, the latter would be appointed minister of agriculture. In this place, the actions of the so-called officials, the background of whose actions were partially revealed by the 2006-2008 VSD parliamentary activity investigation on interests and actions. Based on its conclusions, V. Kučinskas employed his connections with formerly advisor to heads of state and Foreign Ministry secretary Albinas Januška, who was dubbed "grey eminence" a decade ago and the then Baltic Agribusiness Institute head Raimundas Lopata in 2012, dealt in the formation of public opinion of M. Bastys as minister of agriculture. For this, video clips were made about M. Bastys, conferences organised where M. Bastys participated. In October 2012, with the Labour Party publically announcing that in forming the cabinet, they desire the Ministry of Agriculture, the head of Arvi V. Kučinskas detailed to the group's VP Alfonsas Sigitas Tamošiūnas that he should convince the then Lithuanian Social Democrat Party (LSDP) chairman Algirdas Butkevičius to not yield the ministry to the labourites. V. Kučinskas stated that Arvi had done much in order to have "its own" minister of agriculture, that LSDP candidates would win in Sudovia. Delfi reminds that in 2012, a massive clash erupted over candidates to the post of minister of agriculture. The Labour Party proposed former vice minister Mindaugas Kuklierius' to the post. Due to political peripeteia, however, and the vice minister's own statements, he was finally not proposed to the president. In the end, it was a Labourite candidate, who was chosen as minister of agriculture, albeit in two years with President Dalia Grybauskaitė criticising the lack of transparency in the ministry, he resigned. The Labourites claimed then that his decision was based on personal reasons. V. Jukna was replaced in his post by Labourite Virginija Baltraitienė, who worked to the end of term. During his term as MP in 2012-2013 M. Bastys participated in organising meetings between Rosatom representatives and Lithuanian state officials, where Rosatom interests in Lithuania and the region were supported, the NSGK conclusions state. It was found that in 2012-2013 Rosatom prepared and sought to implement a plan – together with Lithuanian companies to create a joint venture, which would exploit current and planned electricity transfer lines to Kaliningrad to trade electricity produced in Kaliningrad and Belarus in planned power plants, using Kruonis Pumped Storage Plant, also to achieve participation in the closure projects of the Baltijskaja nuclear power plant and upon the formation of favourable conditions – the Visaginas nuclear power plant construction project. Based on the report, Rosatom actions in Lithuania, seeking to involve local business in joint projects, seeking to ensure support for Rosatom projects with their aid, is a traditional scheme of the Russian corporation used across European Union member states. Rosatom offers to Lithuanian businesses encompassed broad cooperation opportunities: from minor energy projects in Lithuania, contracting opportunities in Rosatom projects, the founding of financial institutions, through which projects could be financed to major projects – trading in electricity, making use of electricity from power plants being constructed by Rosatom and realising infrastructure projects (electricity links to Kaliningrad). 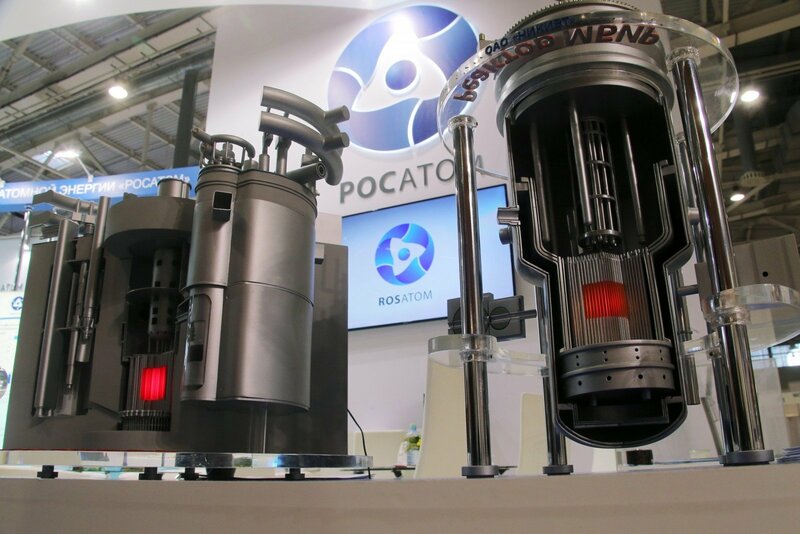 Upon success, Rosatom intended to expand its activities in Lithuania, establish several joint companies with Lithuanian businesses or consortiums, also to make use of Lithuania as a platform to expand its operations in neighbouring EU countries. In 2011, Rosatom presented UAB Vėtrūna, which from 2010 to mid-2012 worked in the closure works for the Ignalina nuclear power plant, had opportunities to participate in the Baltijskaja nuclear power plant project. Later in 2012, other Lithuanian companies were to be drawn into cooperation with Rosatom. The committee has data that in 2012 during the closure projects of Ignalina nuclear power plant, for the negotiations between general contractor Nukem Technologies, 100% of whose stock is held by Rosatom since 2009 and construction contractor UAB Vėtrūna regarding unpaid debt for performed construction works, Nukem representative, former KGB officer Kęstutis Puidokas was involved as a mediator for the two parties, providing necessary information about the situation at Ignalina nuclear power plant, as well as another former KGB officer Piotr Voyeiko and Yevgeny Kostin, who represented Rosatom interests. Rosatom sought to obtain a part of UAB Vėtrūna stock in return for returning the debt to the company and future contracts in the Baltijskaja and Astravyets nuclear power plant projects. Information on the progress of negotiations was handed to Rosatom owned company Rusatom Overseas VP Anatoly Safonov, with whom the matter of Ignalina nuclear power plant project subcontractors was discussed. Based on investigation data, through its representatives and mediators, Rosatom sought to establish a representation in Lithuania, which would deal in the creation of a Rosatom and Lithuanian company consortium. In September 2012, the possibility to construct an electrical connection between Lithuania and Kaliningrad entered review and later – the idea to form a joint company (Rosatom aimed at controlling 40% of the stock), which would trade in the electricity produced in Belarussian and Kaliningrad produced electricity. In order to obtain political consent for these plans, Rosatom sought to organise meetings a number of times through its intermediaries in Lithuania with then Prime Minister Algirdas Butkevičius. When presenting his testimony to the committee, A. Butkevičius specified that M. Bastys contacted him with a request to meet a Rosatom representative, however the prime minister clearly stated, "no meeting will be held", "politically it is not possible ot meet with Rosatom" and warned M. Bastys "So I told him, don't go meet." When answering the question, whether as prime minister he felt Rosatom interest in Kruonis Pumped Storage Plant, A. Butkevičius explained that the Lithuanian Industrialists Confederation also took interest in the matter, with various discussions held in the confederation, but the question was never deliberated on during his tenure as prime minister. A meeting between A. Butkevičius and Rusatom Overseas president Alexander Merten did occur in February 22, 2013 at the Ignalina nuclear power plant closing project sites, but it was brief and not pre-planned. The discussion was regarding Nukem, which was performing the nuclear power plant closure works. The prime minister's agenda did not feature such a meeting. The government press release stated that the meeting occurred at the initiative of Rusatom Overseas, during which the prime minister was acquainted with the projects being done. Former energy advisor to A. Butkevičius Tomas Garasimavičius and former economy advisor to the prime minister Irina Urbonavičiūtė confirmed to the NSGK that the meeting was held and A. Merten was present in it. According to I. Urbanavičiūtė, the meeting featured talks of prospects for the construction of Kaliningrad nuclear power plant, Lithuania's potential participation in the project, be it by loaning out Kruonis Pumped Storage Plant's capacities or other means. The meeting was not on record. In his written testimony, A. Butkevičius notes that Rosatom representatives sought meetings with him a number of times, however all such proposals were rejected. The meeting at Ignalina nuclear power plant with Rosatom representatives A. Merten and J. Kostin was not planned. Failing to obtain the agreement of the Lithuanian government for strategic plans, Rosatom seeks to maintain influence in Lithuania through its company Nukem, which is performing the key projects of Ignalina nuclear power plant's closure. Based on the committee's data, Nukem is actively preparing to participate in expected competitions on new large capacity closure projects still to take place at the Ignalina plant. To this end, it is seeking to ensure support of a major Lithuanian construction company, with which it could collaborate in competitions. Nukem is particularly interested in the partner company having the necessary influence in Lithuanian government and political spheres, which would aid in ensuring success in the competitions. Based on the committee data, K. Puidokas, a former KGB officer who represents Nukem interests, maintains active connections to MG Baltic representatives, who are an interested in their group's company Mitnija participating in Ignalina nuclear power plant closure projects. In 2009, a meeting was held between K. Puidokas and D. Mockus. Contacts between MG Baltic and Nukem, Rosatom representatives continue to be maintained via K. Puidokas, who maintains contact with former MG Baltic VP Raimondas Kurlianskis. Based on the report, from 2016 an important role in these plans was played by Tomas Dapkus, who represents MG Baltic interests and maintains intensive contact with K. Puidokas, who represents Nukem interests. According to the committee's data, in 2018 a public procurement tender for a short and intermediate duration radioactive waste disposal project is to be held, the cost of which based on 2015 data is expected to be 180 million euro by 2022. The NSGK at the behest of the Seimas under the rights of a temporary investigative commission performed a parliamentary investigation on individuals, business subjects and other interest groups' potential illegal influence on state institutions in decision-making. The committee worked from October 19, 2017. A pretext for this investigation was an earlier NSGK investigation on M. Bastys' activities. "The investigation of M. Bastys' actions gave a basis for everything, to the entire public, the people are not naïve and the media understands well that the conclusions on M. Bastys are simply the tip of the iceberg. (...) As such, I believe we need to continue investigating," V. Bakas has told BNS. With the BNS taking up a broad investigation of business and politics relations, the Russian corporation Rosatom came under scrutiny once more. The investigation conclusions are based on State Security Department [VSD] information from 2011, 2017 and 2018. MG Baltic calls parlt committee probe "political farce"